IMPROVEMENTS UNVEILED – Yukon government representatives announce the new Road Maintenance and Improvement Program on Wednesday. 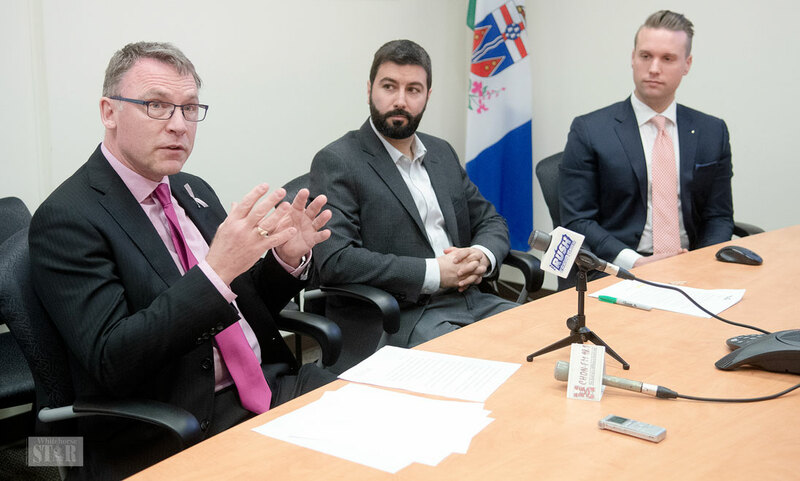 From left to right are Highways and Public Works Minister Richard Mostyn, project manager Michael Zuccarini and Richard Gorczyca, the director of transportation services. The Yukon government has rolled out its new Road Maintenance and Improvement Program, which will see new or revamped line painting and brushing components. Highways and Public Works Minister Richard Mostyn announced the program on Wednesday. He said the territory has not had this type of program previously. As a result, there was no schedule for brush clearing along highways. He said clearing and other maintenance were done on slim information, and there was little to no planning involved. This led to some sections of highways to have trees, while others have grass. “It (brushing) was erratic, it was inexplicable and it was extraordinary for a modern government,” Mostyn said of the situation the Liberals found upon taking office in December 2016. Early last year, the government decided to develop this program. Mostyn explained that this took the current haphazard process to a data-driven one. It’s a six-year program that will help improve a total of 6,200 km of road in the territory. It will stick to high standards and a regular schedule. “This program is going to make Yukon roads safer,” Mostyn said. He turned the floor over to Richard Gorczyca, his department’s director of transportation planning, to speak in depth about the program. Gorczyca explained this program take an asset management approach for highways. The goal is to improve the highways’ lifespans. He explained that data will be used to prioritize what areas need attention. The data gathered relate to traffic volume, whether it’s a trade corridor, links to communities and tourism impacts. The program has five components: roadside delineation, barriers, roadside obstruction, line painting and vegetation control. Gorczyca went through each component, but stated line painting and vegetation control are the biggest ones. Roadside delineation involved objects placed on the road to help keep drivers in the proper lane. This includes reflective markers or rumble strips. The government is doing an option and feasibility study to look at the best use of these objects. Barriers are used to keep vehicles on the road. Gorczyca said there was a site selection prioritization analysis last year. Based on this, the government will be looking to implement barriers in priority areas. As for obstructions, these include both those that are man-made and natural objects on the roads or their shoulders. He said the brushing activity will help reveal some of the issues. Gorczyca said line painting has been revamped, and the planning and implementation have been improved. Currently, repainting is done in areas that need it the most. The government is expected to use a higher-quality and longer-lasting paint. Gorczyca said an appropriate paint thickness has been found which should increase term line on roads. “We’re basically looking for a higher life cycle for our paint,” he said. A new five-level rating system was implemented. This evaluates the state of painted lines and their reflective properties. Line painting will not be a six-year cyclical process. This will start this year with a 700-km stretch of the the Alaska Highway between Haines Junction and Watson Lake. Next year, Gorczyca said, the government will look at painting the Klondike Highway and fill in the rest of the road network afterwards. Crosswalks, medians and arrows will be painted annually on all highways. Currently, the government paints a total of 1,600 km annually; this will rise to 2,000 km. Better vegetation control will see brush removed from the sides of highways, which Gorczyca said should improve safety and reduce vehicle-wildlife collisions. He said the reduced brush should draw moisture away from the roads, which should lengthen the lifespans. The goals of brushing are to improve the sight lines for drivers. The expected improved visibility should help people see wildlife on the sides of the roads, Gorczyca said. “We’re looking to improve highway safety with this,” he said. Some highways will be getting annual brushing while others will receive it every three years. The idea is to have it all complete in six years. Brushing will begin arround communities and move outward. At the end of the program, the government hopes to close all the gaps between communities. Gorczyca said the related tenders should be going out soon. One of the brushing tenders was expected to go out Wednesday with another two in the next week. Project manager Michael Zuccarini said these tenders ranged from $500,000 to $1 million. Work could start as early as mid to late May, Zuccarini said, depending how the tendering process unfolds. The program itself will cost $4.9 million. Gorczyca said vegetation control will take up the most of the budget, at 46 per cent. Barriers come in second with 27 per cent, followed by line painting at 15 per cent, then roadside improvement at 11 per cent and finally roadside delineation at one per cent. He expected that the vegetation control costs will come down once the backlog of brushing is completed. After the backlog is cleared, it should move to just mowing, which is expected to cost less. The vegetation control currently sits at $3.2 million, he explained, but is expected to drop to $2 million. You okay, man? You need a hug or something? Well now here is shocker, the paint is wearing faster than we can put it on the road! Now let's discuss technology here regarding road paint. There has been on the market for at least 35 years road paint that will last from 3-4 years. It was offered as a solution to three successful governments as leap forward to reduce costs. The paint would have cost about 15% more. That is chicken feed when you consider the cost the labour every year and capital cost of the equipment. You ready for this - the answer given was we don't want a fight on our hands with the union. These are union jobs and the union will be in an uproar. Why can't liberals handle the truth? Honestly, have you seen the current brushing work? It is atrocious. Have you seen the current line painting? The amount of money spent on poor work without is stupid. All you have to do is drive the Alaska Highway in any direction and one can observe passing lines where it is not safe to pass, blind corners etc. The amount of money spent on frivolously needs to stop. Who brushes in the winter? YTG had an immense amount of money to spend and was brushing in the winter... was that a great idea. What a waste of money and time. I have been screaming from the roof tops for years about our horrible paint. I was told it was enviro paint and was just no good. We need the same paint they used for the Gay crosswalks. That stuff is bullet proof. All the other crosswalks are gone by fall. I hope YG gets its poop in a group and performs the brush clearing BEFORE everything goes to seed and makes the problem worse by spreading these seeds further. Wow, let's modernize by using higher quality paint. Let's use modern techniques that allow beavers to live in ponds adjacent to roads and not have to kill them. Let's stop the nonsense about how a beaver dam will automatically cause a washout of the road. Let's integrate the use of highway right of ways with city bylaws so designated motorized trails are created. What has management at Highways been doing the last 30 years? Did they forget the right-of-way is part of the highway system? Why not let a woman or two into the upper echelons on the "operational" side of things? How about moving away from the historical practice of placing those who know (only) how to run a grader but have no other management skills or education in managerial positions? Yes. Let's paint the line by October when no one can see them all winter and then they disappear by spring. Brilliant! Glad to see they are going to use a better, longer lasting paint. The paint they have been using is crap. Why don't they start painting earlier? They could have been painting a month ago. One thing I have noticed is every year there are fewer passing areas. From the Hot Springs intersection to town there used to be at least six places to pass. Now there is one place. Every year, fewer broken passing lines. Might as well take the one available passing spot away. The Alaska highway through Whitehorse needs upgrades to make it safe. Accidents are increasing ever year and this minister and government killed the plan to make this piece of highway safer to travel on for Yukoners and tourists.